I crossed the line into full-on Apple addiction a few weeks ago. Not satisfied to wait and watch Apple’s iPad keynote speech after the event, I tuned in to a live blogcast, followed the tweets and photographs as they happened, and waited eagerly to find out about what the “one other thing” bit at the end might be about. Well, as you probably know, this particular keynote event didn’t actually have a “one other thing” part. Instead, the event concluded with a slide telling us that in 2012 there is “a lot to look forward to.” After my initial disappointment that we hadn’t been given a tantalising glimpse of the new MacBook Pro or iPhone 5, I got to thinking: what do I actually want to see from Apple this year? With that in mind, here is my own personal wish list for the iPhone 5 (or whatever Apple decide to call it). I have tried to keep my list practical – I don’t need a waterproof phone. Instead, these are things that would make the best phone I have ever possessed even better. The fact that there was no change to the iPhone’s shape with the release of the 4S was a disappointment to many. It’s time for a change that makes the device look more modern and that makes it clear that it is a NEW iPhone. I imagine case manufacturers dream of this too! 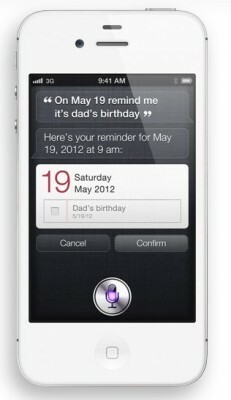 Apple need to prove that voice control is more than a toy, and this starts with making Siri more useful outside the US. Siri’s voice recognition accuracy gives a glimpse of how exciting this technology could be – so let’s see an exponential improvement. A study by a UK company found that 40% of UK iPhone users are using devices with a cracked screen. If Apple could find a way to make the devices less fragile, it would clearly please a lot of people. While we’re at it – we need a practical alternative to plastic screen protectors – they are near impossible to stick on without huge air bubbles. If you compare the cost of a 16GB flash drive with a 32GB flash drive it’s not a whole lot. With Apple clearly wanting us to invest in HD video via the iTunes store, they need to drop a couple of dollars of profit margin and give us more storage as standard. It is surprising that a company as image-conscious as Apple continues to dish our earbuds that are widely known to be dreadful. It’s time for a change. If Apple could tick those five boxes, none of which should be too hard to achieve, I may take my Apple addiction to a yet higher level and go and queue at an Apple store on launch day. What would it take to make you do the same? Share your thoughts in the comments section.